China’s new defense minister has said that the U.S. should take notice of China’s support of Russia, state-run Tass Russian News Agency recently reported. Gen. Wei Fenghe, during a meeting with Russian Defense Minister Sergey Shoigu while attending the seventh Moscow International Security Conference, said that his visit was to show their commitment to bilateral relations. “I am visiting Russia as a new defense minister of China to show the world a high level of development of our bilateral relations and firm determination of our armed forces to strengthen strategic cooperation,” Wei said at the meeting. Wei’s visit to the conference is his first international visit as a minister of national defense. His visit was coordinated with Chinese President Xi Jinping. Both President Jinping and Russian President Vladimir Putin were recently re-elected and wanted to reaffirm their relationship. 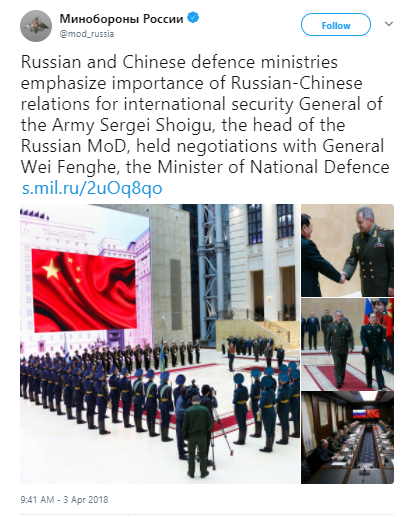 “Thanks to the efforts of the leaders of our countries, the ties between Russia and China are now reaching a new level, unprecedentedly high, becoming an important factor in ensuring peace and international security,” Shoigu said at the meeting. Wei’s comments come at a time when Russia and China are strengthening their bilateral ties and sharing their opposition to a “unipolar” world – a term that describes the U.S. as the main superpower. As part of their strengthening military ties, Russia and China have recently conducted joint military exercises, including exercises in the South China Sea and in the Baltic region.